Ratzakli is a village in southeastern Kefalonia and is located between the two of the most popular tourist resorts on the island, Skala and Kateleios. 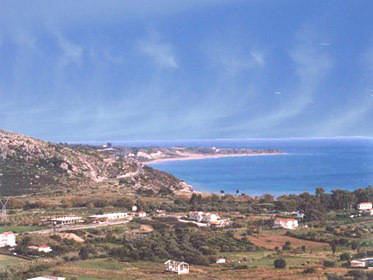 It belonged to a former municipality Elios – Proni incorporated in a single municipality of Kefalonia in 2010, with the implementation of the plan Kallikratis. In Ratzakli live permanently around 100 inhabitants. It belongs to the municipality of Skala, the village located to the east and is among the most popular tourist resorts of Kefalonia, together with the settlements Aleimmatas and Fanies. To the west of Ratzakli, we find another popular tourist destination on the island, Kateleios. The village got its name from the word ratzat, which means raisin, as previously Ratzakli was the production center raisin of the whole Kefalonia. The beach closest to Ratzakli is Kaminia, one of the most spectacular beaches in Kefalonia: golden sand and clear blue waters. On the one edge of even lay its eggs, the turtle caretta – caretta. From Ratzakli, you will admire panoramic view to Zakynthos, Ionian and bay of Kateleioa. On 28th of August at Ratzakli celebrates the village’s church, St. Ioannis (Beheading of precious head), organized a big festival with traditional music and dances.